This is the wasp mentioned HERE, that turned up in my kitchen window after others of its kind had emerged from an old mud dauber nest. I kept this one in a refrigerator overnight so that I might have a chance to get some decent live photos of it. This wasp had an interesting behavior when chilled. Rather than just becoming quiescent, it fell over and curled up into a tight ball with all of its legs tucked in and its head tucked down. Could have been dead for all I could tell. But it wasn't. By the time I could get the first picture taken, it had started to uncurl. The entire progression in the first montage took 1 minute and 44 seconds. There followed an extended period of crawling around quickly while tapping antennae on the rock and periodically stopping to groom itself. Over 20 minutes went by before it finally flew away. I was surprised by the posture shown in the third photograph. Clearly this wasp has a lot more flexibility in its front coxae than I do in my shoulders! 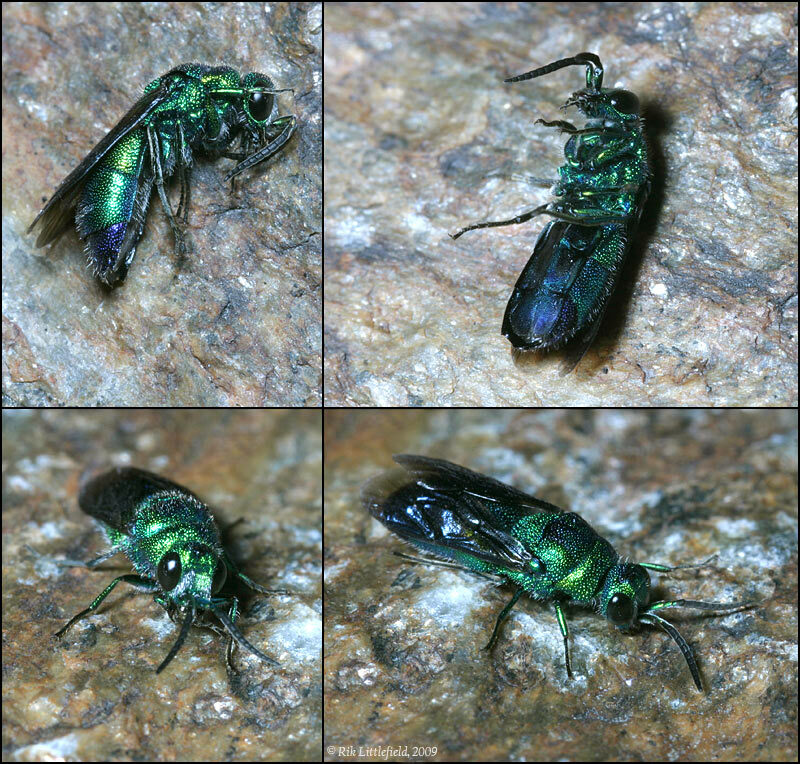 The appearance of this individual is notably green, compared to startling blue in the stack that I posted out. This seems to be mostly a matter of individual differences, or possibly dead versus alive. There are some directional effects -- surround lighting from the pingpong ball in the stack really brings out the blue. But when I take the mounted specimen to the same environment as this live one, it still looks primarily blue. Edit: fix name in title and image files. it fell over and curled up into a tight ball with all of its legs tucked in and its head tucked down. Yes, these chrysidid wasps are known for that. Beautiful animal, isn't it? BTW, You will want to change the title: chalcidid --> chrysidid. 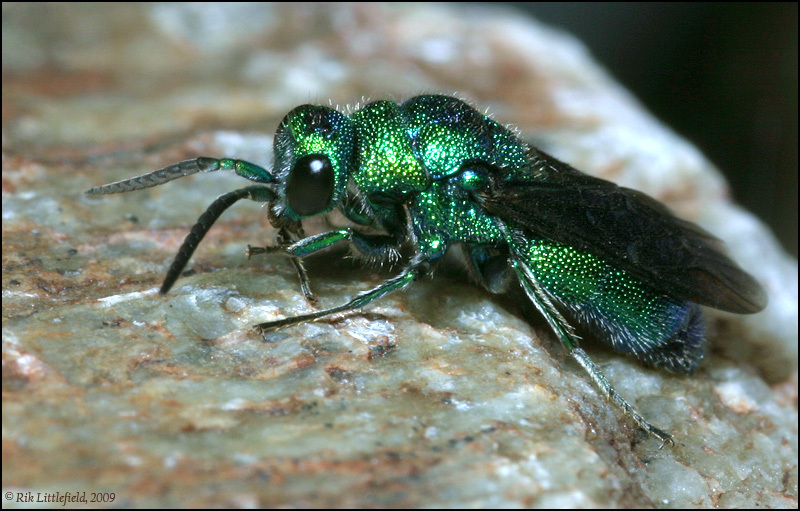 Apart from 1/2 of it's colouration it's very reminiscent of a group of species we have in the UK 'Ruby tailed wasp' (Chrysis ignita) e.g. http://www.wildaboutbritain.co.uk/archive/showphoto.php/photo/68530 . I've found this species to be particularly frustrating to shoot. I don't see many and when I do they don't like me getting close, never seem to stop moving. It's one of the most beautiful insects I've seen and I'd love the opportunity to do some stacks of one! Betty, thanks for catching my error in the name. 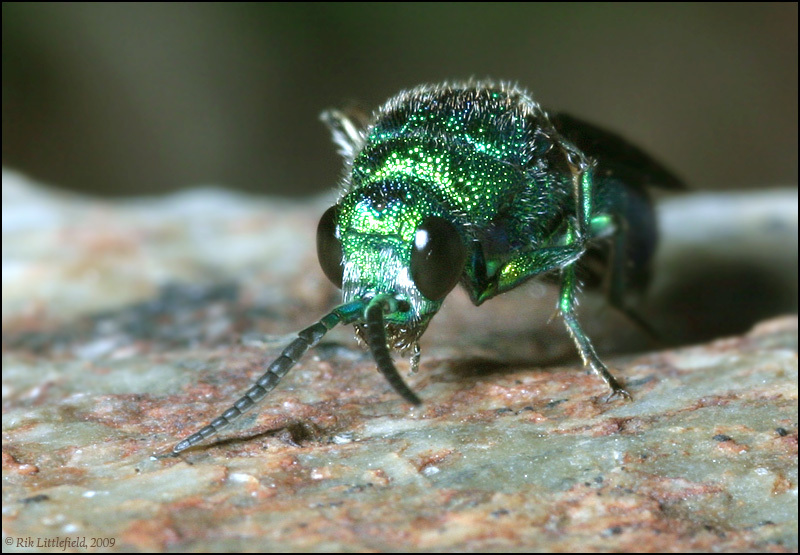 What's interesting is that when I processed the images and wrote the posting, I was literally staring at "Family Chrysididae" on page 379 in How to Know the Insects. But not only did I mess up the name in the title of the posting, I made the same mistake in naming the directory on my computer. Thank goodness for people who tell me when I mess up! Laurie, I have no experience with these wasps except for this one. But I suspect their habits are different from the kind you have. When I first saw this one, it was easily trapped by essentially herding it into a plastic container. I can't say whether chilling it had some long-term effect on its behavior. But even at the end of its warming period it was still happy to crawl around on my finger, and that was after more than 20 minutes at an air temperature of probably 80-85 degrees F (27-29 degrees C). When it did decide to take off, it was just gone -- no warning, no hesitation. I will say, though, that it didn't spend much time just sitting. Constant rapid movements, but mostly around and around in an area the size of a spread-out hand.